Town boss Jamie Fullarton says his side must be better, and has no doubts they will be, in Saturday’s season-opener at Braintree after their 2-1 home defeat to Boston. The Shaymen produced an out-of-sorts display in losing to the National League North team, and were 2-0 down at half-time before Dayle Southwell’s consolation goal. “Every day the tapestry’s being created and opinions on players are evolving. “And today we learned a little bit more about each individual character, some positive, some negative, some areas that reinforces what we already knew, and some new points that have cropped up. On what he had learned most from the match, Fullarton said: “There’s lots I’ve learned from it, and it’s reinforced certain aspects that I was aware of along with the rest of the coaching staff. “What’s vital is we must always stay in the game, be in the game, and how you do that is by sticking together, staying together. “When the three points is at stake, there’s a slight change in mindset, no matter how much you try to recreate it in friendlies or training matches. Asked whether the result was a wake-up call ahead of the start of the campaign, Fullarton said: “The standards are set by the players, and they have been set over a period, individually and collectively. “I think it’s a burst of the bubble of reality of where we’re at. Every time you step on that pitch, whether it’s a training pitch or a match pitch, no matter who you are, you can’t afford not to be at it at every sense, whether it be in or out of possession or any area. “It’s important we learn that quickly. I think it’s burst the bubble of reality to make sure that we’re aware because there’s three points at stake on Saturday. And Fullarton believes Town will put up a better showing at Braintree. “You could dissect it as deep as you want, but ultimately we’ve learned some things that are good to learn in pre-season rather than when the three points are at stake,” he said. 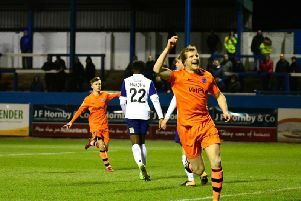 On the reaction of the Halifax fans to the game, Fullarton said: “They care, like all fans, and they want to win every game, which is no different from what I am. “But my interaction with them since I’ve been in the building suggests that they will look at it from an objective, balanced view. Fullarton said there were positives to take from the match, but stressed that his team will be better when the season starts for real. “I think that’s the same for every club, and every group of players,” he said. “I don’t like diminishing the importance of the games in pre-season, because they are important, but you’ve got to look and take the positives. Matty Brown has come through 90 minutes having not played, so he’ll be much better than that. “Others have got more minutes in their legs, leading towards being in a position to being selected. “We’ll look to pick the team to win the game away to Braintree based on a number of factors on where we’re at, what we’re looking to do and how they are. Asked whether he knew his starting line-up now for the Braintree game, Fullarton said; “It’s not as clear cut as that. You have ideas, and what we’ve learned from today and the questions we’ve been asked, and if certain aspects are repeated and start to become characteristics, then that starts to build that picture for you. “Between now and then there are other aspects that will impact or affect the starting 11. Right-back Michael Duckworth has returned to Halifax, and started the Boston game, and Fullarton says talks are ongoing over the defender’s future. “There’s certain factors that will influence that,” he said. “It was good to have Michael in, he’s come in for the last few days at training. Matty Kosylo was again named as a substitute against Boston, and Fullarton said the winger’s restricted use in pre-season is due to him not being able to train with the rest of the squad. It was announced on Saturday that winger Josh Macdonald, currently out with a cruciate ligament injury, has signed a one-year contract with The Shaymen. “That’s great, I’m a big advocate of that,” said Fullarton. “Unfortunately for Josh, he’s picked up an injury as we’re all aware of. “I think the club have demonstrated, and the chairman in particular, how they run things in terms of morally and their integrity. “For someone who retired through injury and went through a very difficult time myself, I fully appreciate and understand where Josh is at the moment. “I’m really looking forward, once he recovers, to have him back on the training field because since I’ve been here I’ve never really had that opportunity with him. On when Macdonald may be back from his injury, Fullarton added: “Being very experienced with long-term injuries and having 14 different operations, I know it would be flying a kite in a hurricane to suggest that. “Everybody has different degrees of an injury so until he has his operation and reacts, you never know. “But there’s no doubt with the support he will have from the club, his mindset and attitude towards it, he’ll be back as soon as it’s possible without the risk of re-injuring it. That’s the aim for us all.